ith 78 points up for grabs if there was to be any chance of taking the title fight to the wire on the final round Craig was very much hoping that he could repeat his Acropolis Rally 2014 success when he took his own and the car’s maiden ERC victory. A very good pre-event test showed promising signs ahead of the Saturday morning’s qualifying stage and those signs were reflected when Craig and his co-driver Scott Martin took third spot on the time sheets. At the road order selection ceremony afterwards Craig selected to run eleventh on the road for the opening leg, one position ahead of Kajetanowicz. As if it had followed him from Corsica a week earlier the weather was to dictate things from the very first stage by causing it to be shortened to a little over half its original distance after the road became impassable due to hours of rain. It was Kajetanowicz that drew first blood and won the stage 12.2 seconds ahead of cautious Craig. 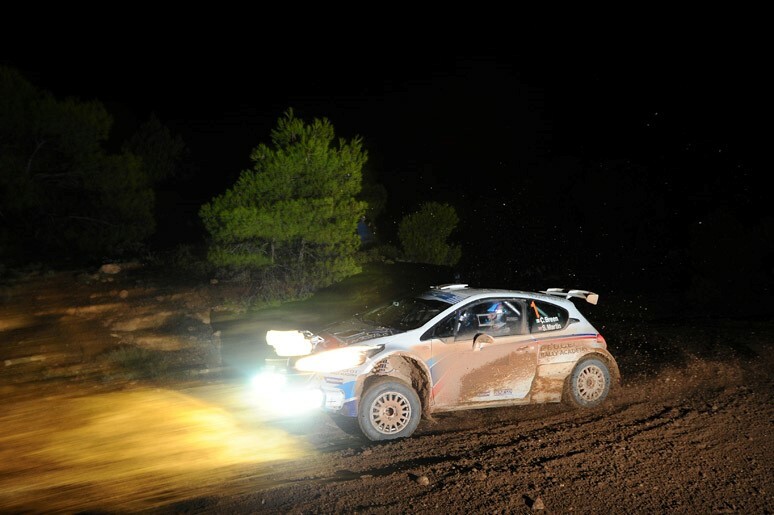 Albeit by only a tenth of a second faster the Peugeot lion bit back on SS2 but no one expected local man Lambross Athanassoulas to go fastest by a staggering 27.4 seconds over the chasing ERC regulars and lead overnight. As day two got underway the ERC rivals set about reclaiming their dominance and for the Peugeot Rally Academy pair there was a championship to hunt down. It was Kajetanowicz that took the opening stage honours but as the fog came down on SS4 Craig and Scott excelled and blitzed the clocks leap frogging them into the lead by over seventeen seconds. They were fastest again on the next stage and that gave them a very comfortable 33.7 second rally lead with one stage to go before the mid-day service. An unsecured bonnet undone all the good work when it flew up on SS6 but Craig felt confident enough that although not an ideal situation to be in they had the pace and three stages left to make up the ten seconds they needed to retake the lead that afternoon. As Craig knows more than anyone even the unimaginable can happen in the world of rallying and this was about to be one of those unbelievable moments. A thunderstorm hammered the region and the organisers were left with no option but to cancel the remaining stages on safety grounds handing the then leader Kajetanowicz the rally win and in turn the 2015 FIA European Rally Championship title. Craig was gutted to be denied the chance to bring the championship fight alive on its penultimate round in the way it happened but safety in rallying is paramount and he understood the reason for the decision. In his post rally interview he descriped it as “a nightmare just when we thought our luck was back on track and another win in sight, I’m delighted for Kajto its great for him to win the championship, but I really wanted to win this one. After the rally Craig was awarded the “ERC Colin McRae Flat Out Trophy” in recognition of his never give up attitude and pace in such difficult conditions over the weekend. The Peugeot Rally Academy team will still compete on the final round of the ERC in Switzerland where Craig and Scott will be hoping they can stand on the top step of the podium once again this year.